You know how I feel about shaving products, girls. Drugstore shaving creams get all over the shower, smell artificial, and leave rust rings on my tub. Luxe products like Whish cost way too much for what they do, and I just don't have time for the whole shaving brush routine. It's another Goldilocks-type situation, friends. So, I usually just use a bath oil, shaving oil, or shower gel. But using up all my good L'Occitane Amande Shower Oil and Jo Malone bath goodies has been driving me nuts these days. Fortunately, an alternative arrived on my doorstep last week, in the form of eos (Evolution of Smooth) Ultra Moisturizing Shave Cream. 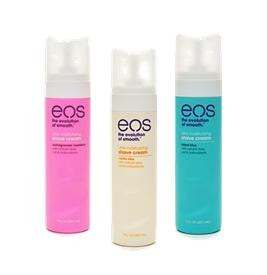 eos Shave Cream has the texture of a body cream; it doesn't foam, so it stays on your legs instead of getting flung hither and thither in the shower. It's thick and moisturizing, so you can even use it without wetting your legs first (come on, you know you've done this in a rush...shave and then stick your leg into the shower to rinse). And it really is quite moisturizing; my legs stayed soft all day. As for scents, it comes in three: Pomegranate Raspberry, Vanilla Bliss, and Island Dream. Pomegranate Raspberry is your standard issue fruity scent, similar to the old classic B&BW Sun Ripened Raspberry. It's ok, but not my favorite. Island Dream has a lovely name but unfortunately, smells like nothing Mother Nature ever created. To me it was a very synthetic marine scent. Vanilla Bliss is the best of the three by a mile; it's a creamy, soft vanilla with a hint of sandalwood. Absolutely delicious, and more sophisticated than the vanilla offerings from its drugstore competitors. The eos containers are made completely of recyclable plastic -- no metal whatsoever -- so there's not even a remote chance of the telltale rust ring in your shower. Best of all? Unlike other "specialty shaving" products like Whish, eos is cheap cheap cheap ($4.99) and widely available, at Target, Wegmans and drugstore.com.